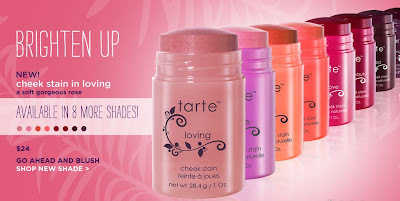 As soon as I saw that Tarte Cosmetics had a new Cheek Stain in Loving ($30), I was all over it. I'm a huge Cheek Stain fan, and Loving appeared to be my kind of color. 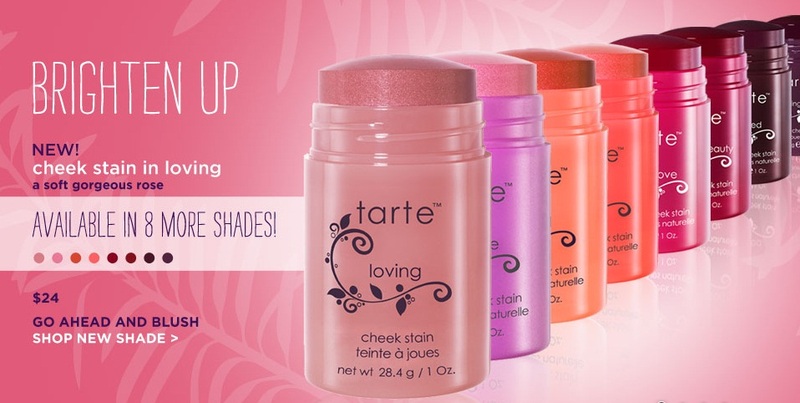 Tarte's award-winning Cheek stains provide a healthy, natural glow. The beautiful cream formula in stick form is free of alcohol so the product won't dry out your skin. They are also oil-free so they won't clog your pores. They are infused with the Tarte's proprietary t5 Super Fruit Complex for a healthy dose of natural antioxidants. Tarte t5 Super Fruit Complex is a blend of five active superfruits: goji, acai, maracuja, acerola, and pomegranate. The first blend of its kind, the t5 Super Fruit Complex is loaded with naturally occurring, antioxidant rich nutrients and vitamins that have been known to deliver refining, anti-aging, and skin-restorative benefits with each application. I was a little surprised to see the difference between the actual product and the promotional photos. Not disappointed, but surprised. The color is much warmer and more peachy and bronze than I had expected. It's gorgeous, just not what I envisioned. Check out my swatch photos, which I took in full sun. This Cheek Stain is not pink. The Tarte Web site calls it soft rose. I'll call it a bronze-peach with a shimmer that will flatter anyone. I applied Loving heavily straight from the tube. I did not blend it or even it out for these photos. Blended, it's absolutely stunning. It gives me a summer glow. I love it, even it it isn't what I expected. I think I must have eight Cheek Shades, and I'll continue to order every new one that's introduced. They are perfect makeup. 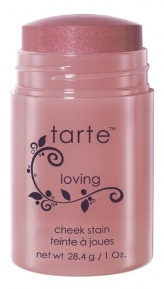 You can order Loving directly from Tarte's Web site, where you can see the Fall 2012 Collection. You can also purchase Tarte Cosmetics at Sephora. This is the first time I've found Tarte's color representation to be "off." Still, I'm happy. Have you tried Loving? That is really a gorgeous shade. I think so too, Suselew! You can't even see the tiny micro-particles in my photos. They make the color jump right off the skin (in a good way). Hi Charlestongirl, I think I'd have to go with your 'bronze-peach' assessment. It looks like the perfect almost tan color for the end of summer! It's really a gorgeous shade! I've never bought a Tarte Cheek Stain because I'm really not into cream blushes. This one might change my mind thought -- what a gorgeous looking color!